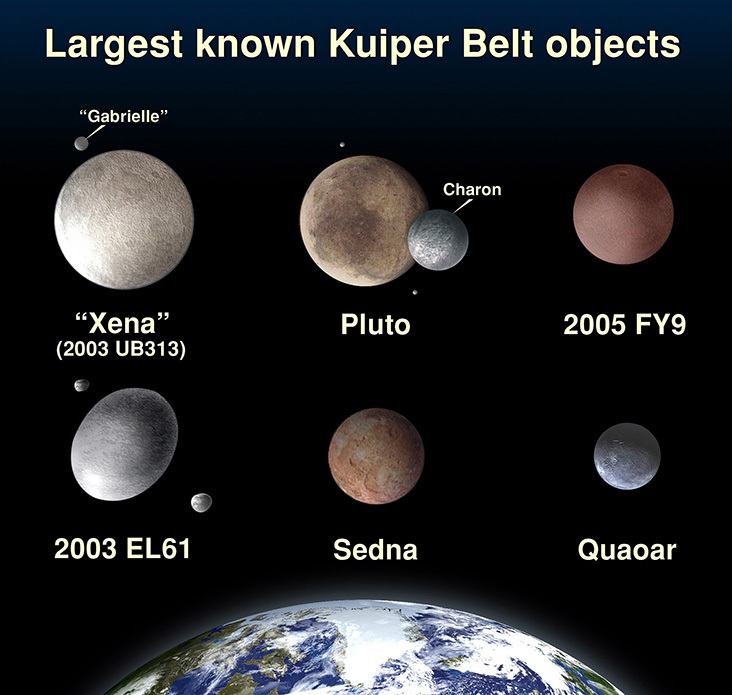 The Kuiper Belt is a disc-shaped region beyond Planet Neptune between 30 and 55 astronomical units (AU) which is a subset of the broader trans-Neptunian region. 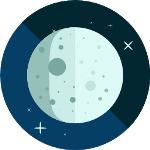 It is populated with icy remnant minor planets (and dwarf planets) that have roughly circular orbits and low inclinations from the ecliptic. 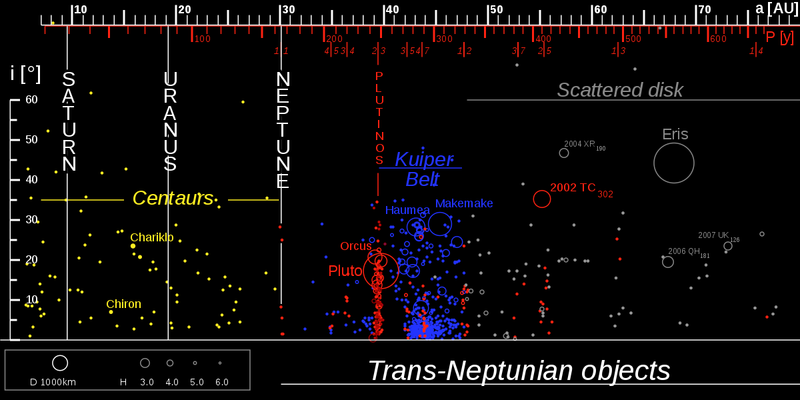 The region of space beyond Neptune (trans-Neptunian) is divided into three subpopulations: the Kuiper Belt, Scattered Disc and the Oort cloud. Gerard Kuiper proposed in 1951 that the existence of a belt of icy objects beyond Neptune left over from the solar system's formation must exist to explain the regular appearance of short-period comets. 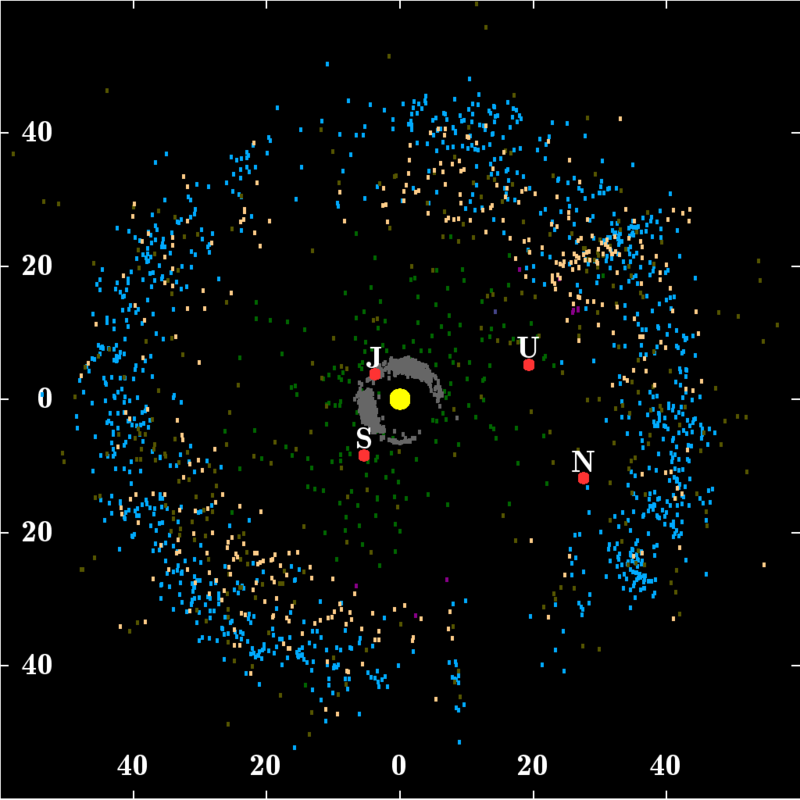 With the improvement in astronomical technology, the first of these distant faint objects was discovered in 1992, with several thousand Kuiper Belt Objects (KBOs) having been discovered to date. It is believed that the population size of KBOs over 100 kilometres (62 miles) in diameter may reach hundreds of thousands and into the trillions for smaller icy bodies. 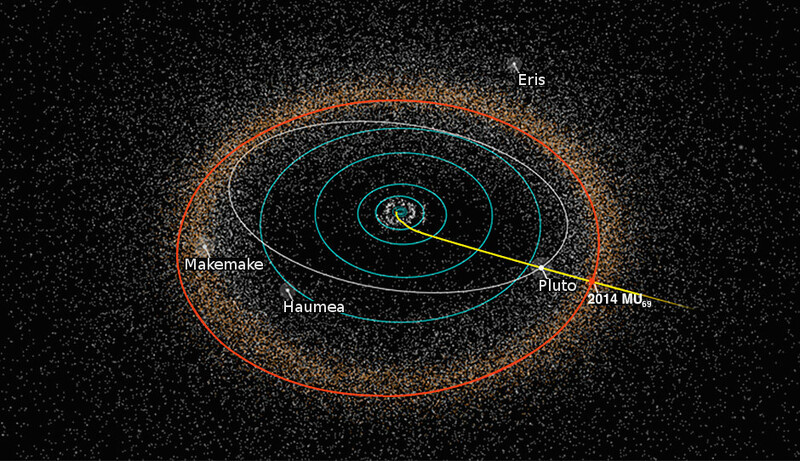 The dwarf planet Pluto is the most famous member of the Kuiper Belt (and the Plutino subgroup), with Haumea (and its two moons Hi'iaka and Namaka) and Makemake recently discovered dwarf planets which also orbit in the Kuiper Belt. 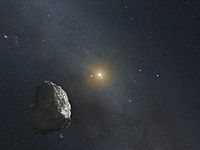 The discovery of these large KBOs, with orbits similar to Pluto's (along with the discovery of Eris in the Scattered Disc), led to Planet Pluto being demoted in 2006 to a dwarf planet. Analysis indicates that KBOs are composed of a mixture of rock and a variety of ices such as water, methane, and ammonia. The temperature of the Kuiper Belt is as low as -243°C (30 K), so many compounds that would be gaseous closer to the Sun remain solid. The Planet Neptune is thought to have captured the suspected former KBO Triton, an analysis of its surface shows it’s largely composed of similar materials (methane and carbon monoxide) to Pluto. The KBOs are believed to be in stable orbits around the Sun, so are unlikely to be the predominant source of short and long period comets. 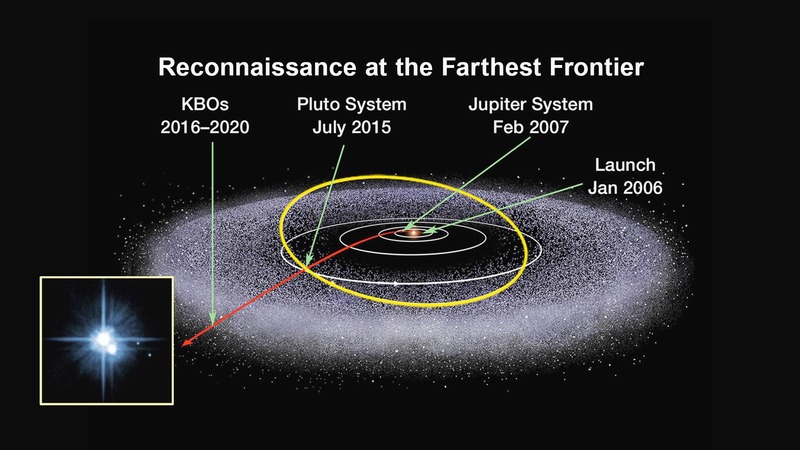 NASA's New Horizons spacecraft flew past the Pluto system in July 2015 becoming the first spacecraft to perform an up-close study of a Kuiper Belt Object. The probe continues to travel further into the Kuiper Belt and will flyby the small (20-40 kilometre diameter) icy object – 2014 MU69 on January 1st 2019. It is likely New Horizons will reach the edge of the Kuiper Belt early in the 2020’s as it approaches the Scattered Disc. Careers In The Space Industry! Checkout The Cool Looking Dream Chaser Cargo Spaceplane! What Are Black Holes And How Do They Form?